The Cyber Week specials are plentiful at Macy’s this week and there’s one in particular I know you all will want to jump on: BOGO FREE Fiesta Dinnerware! 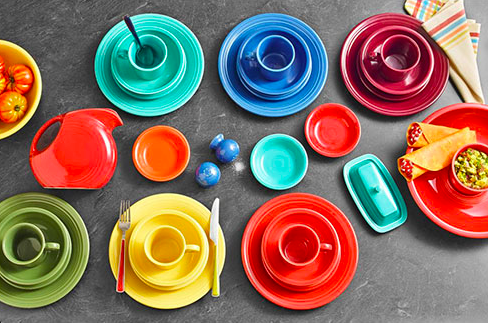 Whether it’s for decorating your holiday table, giving as a gift, or replenishing your own dinnerware collection, Fiesta has had a place at many a table over the past century. For those of you who don’t know the brand, Fiesta (or Fiestaware as its often called) is a line of ceramic glazed dinnerware manufactured and marketed here in the USA since its introduction in 1936. Between its variety of bright colors and its durability, Fiesta has actually amassed quite a following over the years, hence why I know many of you will be quite excited about this sale. Of course, these are just three options among many. Perhaps someone you know is getting married in the spring and has registered for Fiestaware; this is the perfect opportunity to spend the same amount as you were planning to spend on their gift, but get them twice as many pieces. When you place two Fiesta pieces in your cart, the lower-priced option will be deducted once you proceed to checkout. Don’t forget to check out all the deals going on during Macy’s Cyber Week. Use code CYBER at checkout and you’ll get up to an extra 20% off and free shipping with any purchase of $25 or more.